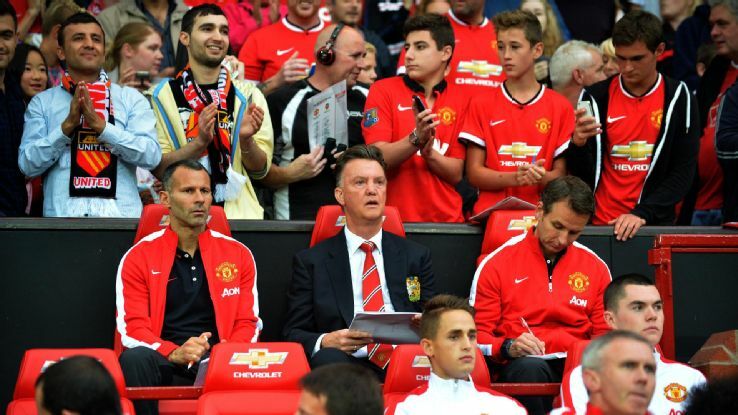 … Van Gaal has never been a “template” manager, someone who brings an identical approach to different sides. He’s often used 4-3-3 and 4-2-3-1 as his first-choice formations. The latter part of the formation makes most sense. In Wayne Rooney, Robin van Persie and Juan Mata, Van Gaal possesses three ultra-talented attackers who prefer to play centrally. Using those three together in central positions makes perfect sense, which means a “…1-2” format is natural. In theory, the 3-4-1-2 allows United to have a spare man in defence and ensures plenty of thrust in wide positions. It’s highly questionable, however, whether the other seven outfield players suit the formation. For the first two games of the Premier League season, Van Gaal has been without any recognised full-backs, and therefore playing a four-man defence would have been extremely difficult, which is why using Antonio Valencia and Ashley Young as wing-backs was a logical, if far from perfect, solution. But when Rafael and Luke Shaw return to full fitness, and when Angel Di Maria completes his imminent transfer, it makes sense for Van Gaal to play 4-3-1-2, rather than 3-4-1-2. Up front, Van Persie, Rooney and Mata would continue in a tight, central triangle, and while there would be less natural width (with the wing-backs becoming full-backs) there would be more forward running from the “shuttlers” on the outside of the diamond, who could charge forward with a solid holding midfielder protecting the defence. The Argentine is frequently misunderstood and often termed a winger, which suggests he’s in the mould of Arjen Robben or Gareth Bale. In reality, at no point in his seven-year European career has Di Maria played in a front three — he has generally been tucked inside into a deeper, more central position. Further back, United could revert to a back four comfortably. Shaw and Rafael could be wing-backs, but they’ve both been trained as full-backs and would be more at home in those roles. Perhaps the most interesting position would be the holding midfield role. Here, Van Gaal could play Michael Carrick or perhaps Phil Jones, who has been one of United’s better performers in the opening two matches. Van Gaal is a famously stubborn individual and would be reluctant to change his approach so soon, but Di Maria’s arrival means United have a squad perfectly suited to 4-3-1-2.